But what about the sites that are stuck in the past. Some sites are still stuck using the "not so beautiful" look and feel. But if you are a geek you should know how to theme the sites you visit the most and make it more suited for your needs and hence more pleasing. "Stylish" is an extension that is being developed by Jason Barnabe has been around from around 2007 but not everyone knows about it. 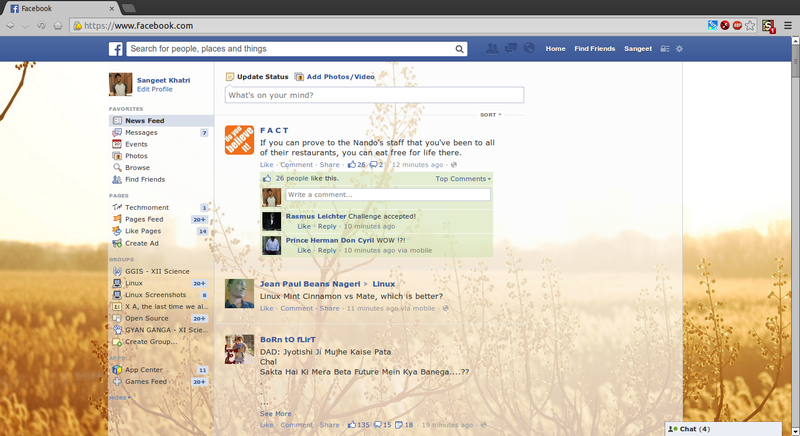 It is an extension available for Chrome and Firefox which lets users use themes on webpages they use. It is a nice tool that let people customize web as per their needs. It is like the "Greasemonkey" for themes. It can be used to customize Google, Facebook, Lifehacker, Twitter, Tumblr and any other site you could think of. Below are some points that why i like this extension so much. Very easy to use and discover new themes. Themes can be switched on the go without any need for reloading the page. If you have some knowledge of CSS, you can make your own themes very easily which brings me to the next point which is..
Making themes is very easy with an easy to use "code writing box" and code is "color coded" for ease of understanding. It is very easy to tweak/change a theme you have downloaded. Makes your sites look beautiful. Users can also upload their themes for other people to use. There is no way to exclude some specific pages of site. You have to create another entry for that and write some extra code as a workaround. Though it is something regular users won't notice at all. But the people who make themes would definitely notice. Sometimes the site where all the themes are stored gets down randomly. So as you can see these things do not make it a what is called "Deal Breaker" , but can be annoying rarely. As i mentioned earlier, "Stylish" is available for Chrome and Firefox. Using Stylish is extremely easy, all you need to do is download it for Chrome from "Chrome Web Store" or for Firefox from "Firefox Add-ons". After it is installed, just go to the site of your choice. Click the "Stylish" icon (in case of Chrome) and just click "Find more styles for this site" and it will open a site in a new tab which has all the collection of themes made by different people and the themes being "CSS styles" downloads in few seconds. You can also check out themes that i have made at "SangeetKhatri (My Current Account)" and "Youtindia (My Old Account)" for some great themes that i like (ofcourse i made them :D ) . And you can find any theme made for this extension at UserStyles which hosts thousands of themes for thousands of sites. Stylish is indeed a great extension that let you customize the last bit of your computer that was once uncustomizable extremely customisable to the extend you would like to. It is one of the few things that i cannot live without. If you find this tool awesome please feel free to contribute to the developer of this project and the whole team behind it for giving us such awesome tool for free. If you already use this, feel free to share the themes you use the most. And also check out the themes i have made (because i love them). And if you feel like sharing something, the comments are waiting for you.